The second annual Robins Equity Research Roundup, presented by Catalyst Research Management Group, was held in Hood River and brought small and microcap equities together with portfolio managers, hedge fund managers, retail brokers, mutual fund managers, and individual investors. According to Marc Robins, creator of the Robins Equity Group Roundup, there is a cluster of people who like to follow small cap stocks. New science, new technology and job growth are all part of small-cap companies. Robins, who published The Red Chip Review for nearly 10 years, has been following small cap stocks for nearly 40 and is considered an icon in the industry. 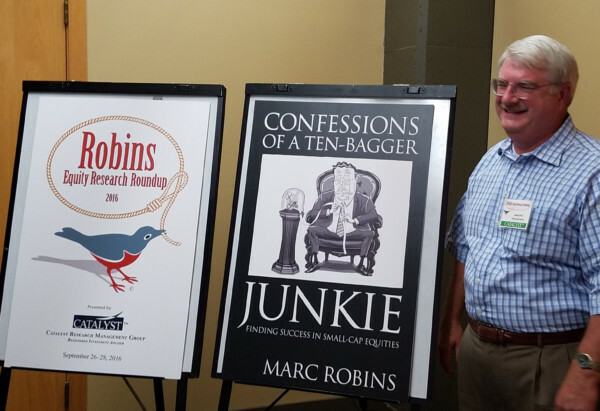 Robins is currently putting the finishing touches on his upcoming book, Confessions of a Ten Bagger Junkie. A ten bagger is an investment that appreciates to 10 times its initial purchase price. “Marc and this event gave me access to many people that I would not have otherwise had access to and the format of this conference was unique in that it allowed for opportunities to talk with people outside of the walls of a conference room or office; I played a round of golf with two money managers and an internal investor relations consultant/executive, and enjoyed dinner and a cocktail each night with fund managers and other investment professionals, where we had a chance to get to know one another to build relationships and trust, which is a key part of my job,” said presenter Peter Seltzberg. During the Robins Equity Research Roundup companies were allotted 40 minutes each to explain what made their company a sound investment choice. A short question and answer session followed each presentation. The afternoons and dinners allowed for more queries. The conference began by 8 a.m each day; catered lunches made it possible for companies to present during lunch and each day was wrapped up by 2 p.m. giving visitors the chance to enjoy the beauty of the Columbia River Gorge. Some spent the afternoon hiking, others played golf, while others just explored the area. This scheduling platform was well received.